Our trip home was uneventful - Princess Ziva slumbered the whole time. She pottied in the yard, to much praise, then spent at least 3 hours scurrying around her new castle exploring. She managed to find a lot of fuzzies that ended up on her whiskers and eyebrows - I see she'll be very helpful with housecleaning. Every few minutes she'd come to give one of us a kiss, then run off again. She's already learning she shouldn't go into the living room. She took us girls for a brisk walk (not too long - it was cold! ), and finally collapsed on my lap. She's snoring next to me now. 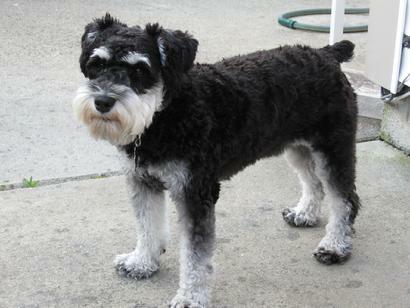 Oh, she also barked at the black schnauzer girl in the french doors to the deck, who looked amazingly like her. Her vet appt is Monday. We'll be sure to let you know how things turn out. Will convey the kisses, and Michael is working on pictures. Homer and Uschi are getting along famously! They play and play, Uschi mothers him, teaches him how to play with the toys, watches out for him, and can't stand to be separated from him. They occasionally fight and tussle, but mostly when they get tired or have just had enough of one another. They are funny and delightful. A lot alike, but very different at the same time. I swear Homer could spend all day eating - he's just about figured out how to open the airtight food container, I think. He can jump a foot off the ground if he thinks there's food that high! And he can bark and growl like he's a 100 lb German Shepherd! Uschi gets way more exercise with him than she ever did with just us. So they're both doing great and we're so happy! Uschi and Homer hunting for "something"
Hi...this is Flynn. Judy said you ask about how I am doing so I thought I'd respond myself. I'm now 10 lbs so the term I've heard being used is "growing like a weed". I one am a pro at riding in a golf cart. I'll send you a picture where I'm on one of our evening cruises. I've made a lot of friends by taking our ferry boat over to the vet and to go with Judy to do errands. One of my favorite places on Hilton Head is the bird seed store. She has dog toys and treats for us. I get to roam the store and look for hiding places for the toys..very cool! I'm now doing two long walks a day and seeing deer, squirrels, big birds, little green lizards. We have a big bird feeder in the backyard and so I watch cardinals, bluejays, painted buntings, red tip blackbirds, woodpeckers, humming birds and more. My job is to clear them out every so often! One of my good friends is a Bichon named Putter. He's a little laid back but I'm working on that! I have several island aunties who come by to play with me - Joanie, Denise and Bayne. So all and all really good. I've been to DC now twice but really like the island's slower and quieter life style but working on my city style. I can't believe I'm going on 5 months and learning new things everyday. I'm really a good car traveler. As soon as I'm settled in the car I go to sleep. I've learned to have my picnic lunch in the car in all kinds of places - parks, parking lots, on the boat. I'm still sleeping in my crate in the bedroom but am getting to "nap" in the bed a little now. I'm staying in my crate when terry and Judy have to leave and enjoy the smooth jazz music they play for me! I hope everything is good with Fergus and Finnian. Please tell mom and dad hello for me. Judy said she will definitely send more pics as she receives them. Thanks for my great start. 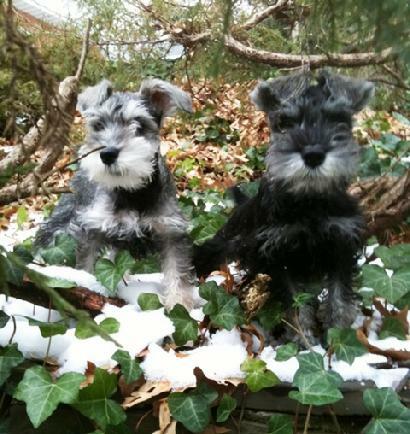 I wanted to write a few lines to you during this �pause� before Zoe�s and Riggins� puppies are born to tell you how extremely happy we�ve been with our little Edgar and Emmet from their (Zoe and Riggins�) last litter. When we brought them home from your house last Thanksgiving, they were brimming full of affection, good health, and joy � and here it is almost 4 months later and they have all that and so much more. With the training that you gave them, they were fully attentive and ready to learn!. Since they�ve come to our house, we carried on with what you started and they�re now experts in sit, stay, come, �leave it� and �no talk�. They walk amazing well on the leashes � even through our park/woods where they meet all kinds of children, dogs, and other exciting critters. They�ve learned to ignore the flocks of geese that are constantly flying over, as well as the many helicopters (we�re fairly close to the Pentagon), and the miniature collie up the street who barks rather endlessly. 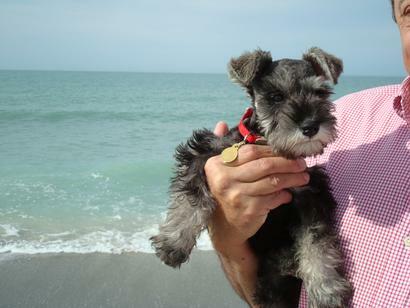 They are affectionate and entertaining, as only miniature schnauzers can be. And while they�re respectful of the house rules, they�re not above the occasional (or should I say daily) prank. A favorite of Emmet�s is to quietly steal my shoes (one at a time) when I slip them off my feet and deposit them in the family room by the door to the outside. He may not speak English, but he sure can communicate clearly! Our Edgar, the paragon of �the perfect child�, is less of a prankster, but is positively dedicated to waiting patiently atop the short flight of stairs until his brother unsuspectingly saunters by, whereupon he leaps down in a swift and accurate pounce that then starts a fun bout of sibling wrestling. They always have a smile and a look of happy anticipation for us, and greet and entertain all of our visitors with their endless "joie de vivre"! 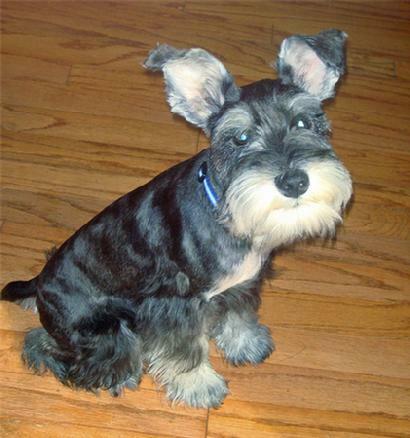 The vet says they�re as healthy as can be and have very pleasing personalities. What more could we ask for? So thank you again for all the expert skill and hard work you put into raising the puppies. It has come through immeasurably in our two funny and terrific little guys. If any of your prospective families/owners would like a reference to contact about your puppies, please do not hesitate to pass along my email to them. Best wishes to you and Princess Zoe as you go through labor and delivery in the coming days! Bentley has been eating all his food. I have been adding warm water to his food and letting it soak....that seems to be the ticket (I figured that out Sunday morning). I have an appt. with Dr. Reed on Friday and I will definitely say hi for you. Bentley has been settling in great. Today is his first day alone, but I am going home for lunch to feed him and let him have some playtime. Last night was the first night he didn't cry when I put him in his crate. I am truly amazed at how well he listens and how is adjusting to the new environment. He even has some new playmates...Penny (my mom's golden retriever) and Soda Pop (my sister's yorkie). I will check back in with you after the vet appointment on Friday. Elvis first visit to the vet went great - I really liked the doctor, explained everything in detail about the puppy and what's going on at this age. Elvis is well - he knows who's who in the house. He is obedient with daddy, cautious of Catalina, and is a big boy who likes to play with Ramez all the time. He's very smart, and cautious right now. I am going to get a plastic pool and put sand in it to play digging exercises, I think he'd like that based on what Cesar Millan says in his book. He's staying dry at night for several hours - did you take him out every 2-3 hours during the night when he was a baby? I'm amazed how dry he stays during the night in his crate! I use the clicker with him and he sits and waits for his little treat.....and also after he goes poo outside, he hears the clickers and his ears pop up and literally smiles. So times are good with the puppy....need to get him ready for his picture at the Mall this Sunday coming up with Santa, they do a special session for pets. Let me know when you get that Facebook group page set up so I can add myself to it and post pics of Elvis. After one week, Elmo is fully integrated into the household. His vet visit went well; he is in great health and seems to be growing right in front of our eyes. They gave me a schedule for future visits, and some sample dry puppy food. Elmo likes to nap (sometimes on my lap) and is very active otherwise. 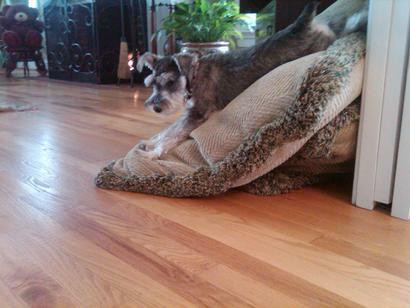 He continues to re-arrange all the throw rugs in the kitchen, and loves to shred any piece of paper he encounters. Fortunately, he doesn't eat the paper!! He loves to chase a tennis ball, but can't get his little mouth around it yet. He also has found the doggie-door to get into the back yard; and he is STARTING to get the idea of housebreaking-- that will still take time. Maggie has not fully accepted Elmo yet. She growls at him when he jumps on her face; and she sometimes parks herself on top of the couch, out of reach, when Elmo wants to play with her (which is all the time-- he loves her). But she will be ok eventually. The cats tolerate him unless he wants to play with them; then they flee. Elmo is eating well, and I put Maggie on his food too lest he eat all her (canned) food. Elmo somehow gets hold of the empty cat food cans from the recycled bin and licks out any remaining morsels. I know this isn't going to kill him, but I have watch that. When I feed the cats, I have to put their dishes out of Elmo's reach, or he will eat it all. The cat food smell, I am sure, is irresistable. Maggie knows to let the cats eat first, then she can lick out the remains. Elmo doesn't know this yet. So everything is going great. Elmo is happy, and so are we. Edgar and Emmett and family checking in! Phew! Are those two little guys ever full of energy! 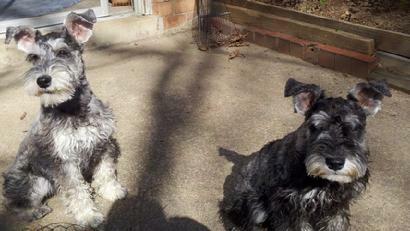 They have two very different personalities and lots of love for anyone who passes the sniff test. Edgar, as you told me from the start (! ), is so loving, a bit shy, and attentive to what mom's saying. Emmett has his own agenda (is he a second child by any chance?) and is the one who takes on the big scary log in the backyard... or the wind-up, walking stuffed pig, and isn't quite so attentive to the mom unless there's food involved. (I feel like I'm re-living the raising of my two sons!) Both pups are amazing, any way I look at them......they've known only great love and patience as they've grown in this home. It will be interesting to observe them as they commence Puppy Head Start next week! Little (I say little but he's quite a bit bigger than his brother) Edgar finally figured out how to hide his treasured stuffed squeaky duck this morning. He took it outside into the backyard and buried it under a pile of leaves! It reminded me of Maddie, our last mini schnauzer, who did the same thing... and in the spring I'd be raking leaves only to find an eyeball staring up at me. Yikes! Tomorrow we go back to the vet to get the next set of shots. I'll get back to you with their weights and anything the doctor has to say about them. I love your Welcoming Committee photo on the website! It's great! I'm sure you're enjoying having your son home from Afghanistan. On the topic of sons, this past weekend our oldest (26) proposed to his sweetheart of 5 years whom he met at William and Mary. Very exciting! I guess Paul and I are just a few years and events behind you. I check out your website from time to time and I know you've been busy with litters. Congratulations on Dorey being pregnant, sounds like she's due very soon. 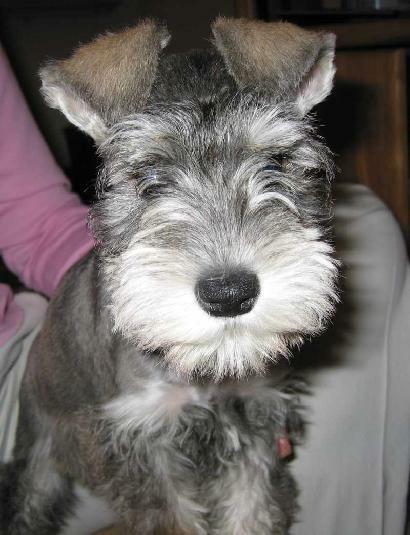 Callie, like Dorey is very verbal with grumbles, whines, cries and barks. She lets you know what she wants! When she yawns, she whistles loud enough to wake the neighbors. we do our best to keep her ears clean despite the lack of plucking. So far so good. I know you like pictures, so I attached a few. The first two are from 3 weeks ago before she got clipped. I like her furry even though she looks chubby, but she gets hot. The 3rd photo I took this week. She is 13.5 inches tall and weighs 16.3 lbs. The offer still stands to come and visit when you're in Virginia Beach. Thank you again for Callie. We just love her so much. I hope you have a safe move. 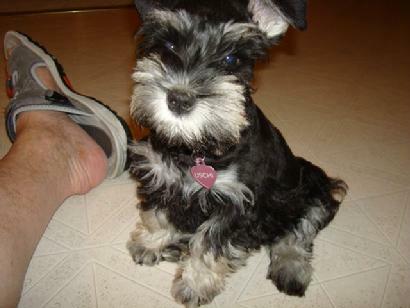 I attached a couple pictures of Xena. She is doing very well. Xena and Deuce are still best buddies. Xena was spayed in April. Is there a form I'm supposed to send you from the vet? We wanted to send you the attached notice, showing Uschi (aka Dazzle) has been spayed and had her umbilical hernia repaired. She went in Thursday and is recovering really well - back to her playful self already! 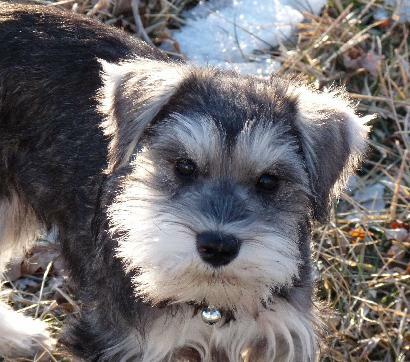 Uschi graduated "Good Manners" class a couple of weeks ago; she's pretty good on the leash and has learned a number of commands. She is so gorgeous, people stop to coo over her. We love her dearly. turned up his nose is lettuce. fanatical barker, so I guess it all evens out. after the first, uncertain encounter. Doesn't mind the rain unless it's pouring. box to play with and that ofter there are things for him inside the box as well. Loves it when people visit. photos on your site. Give Dash's love to Lola and tell her "good job!" Thanks for the email. We are doing great and Diesel is wonderful. He celebrated his birthday with a homemade treat and new toys. Him and Gavin are the best of friends and he is an awesome addition to the family. I have attached some pictures for you. I totally forgot to send you the documentation and will do so right away. I contacted the vet this morning to get a copy. It was great talking with you this morning. I just weighed her and she is 13 lbs. Please let me know when you'll be up this way again. Abby is doing great. We might try to come down after the hurricane season. I�ll let you know so we can arrange for you to see Abby. 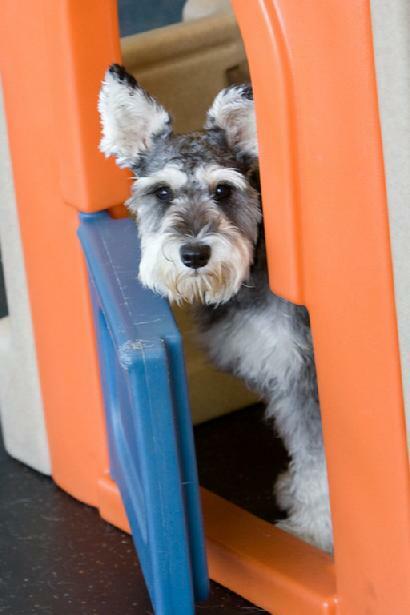 We are in Rally classes now and I hope to take Agility in the Fall when she has finally turned two. Can you believe that she is almost two now? Next Saturday, after class, Abby is getting a full dog message from one of the club members who is learning how to be a dog masseuse. Isn�t that a hoot? I usually give her a back rub which she likes, after we have the nightly wrestling match brushing her teeth. She isn�t too fond of that toothbrush. I honestly never thought I would be brushing a dog�s teeth every night. Grin�. We spoil her rotten, mostly because we dote on her. She is such an unusual dog, nothing like any dog we have ever had before. She understands so much language that it is scary. Plus she knows what we are up to all the time. I get home from work about 4 and she always goes to the back door to wait for me around 3:45. Ken tells me she has a clock in her head about various things. It is so funny now, because as a matter of course, we are always trying to figure how we can take her with us everywhere we go. She is a great little traveler. Week after next we are taking her to West Virginia to visit Ken�s Mom. There is nothing she likes better than to ride in the car. This will be another seven to eight hour trip, but that doesn�t bother her a bit. Take care and I can�t wait to see the boys in their weekly pictures. I�ve attached a picture of Abby that Ken took last week. It has been a long time since I have updated you on our little girl. She is doing great. All grown up and everything. I have attached some pictures. My mother is now looking to add a little girl to her family now that she is able to work from home. I see that you have a little coming soon. If I remember correctly, Zoe and Riggins are Hailey�s parents too. Please send me any pertinent information and I will forward it, with your contact information, to my mother. CiCi is an absolute love. She is full of life and energy, has ruined only a few pairs of shoes - ha! - and is a wonderful addition to the family I will send some photos too. We can't bring ourselves to clip her super short as she is so cute with her messy "do". I wanted to share some pics of �Rudy� experiencing his first field day at the elementary school. He just loves the kids and they love him. Rudy now weighs a little over 13 lbs and continues to love his food (which makes him really easy to train). We started puppy classes last week. Rudy is definitely full of himself so I am anxious for the continued training. My plan for Rudy is to be at therapy dog for children and feel confident that he will do a fantastic job. Hope all is well with the new pups. How is the boy? We're getting ready to celebrate Watson's first birthday and I wanted to send you a photo so you can see how much he's grown! He's really enjoying autumn. Summer was nice and he got to ride in the car on our family trips but he likes the cooler weather now - longer walks and there are great big crickets to chase! He's still quite the center of attention. The boys have featured him in their school projects. His toys have been categorized and graphed and he's even been the subject of a haiku. I hope the move to NC went well. What a lovely place to live! We named Delmy Callie and she's doing fine. We took her to the vet today and he said she's too cute! He said she has loose knee caps, but not to worry since this is common and usually goes away, but he needed to note it in her records and will check her each visit. She goes to get her shots next week. He said overall she's a healthy pup. I am most surprised at her potty training. No accidents. At first I was taking her out every hour or so but she only goes often in the mornings. Afternoons it's as long as 3 hours. Sometimes she lets us know when she needs to go, by a different sounding bark or whine - very impressive! She sleeps quite often and sometimes in the strangest positions we've ever seen. She's often silly during playtime and loves to be rubbed and cuddled - I think she misses the physical contact of her siblings swarming around her. We're trying to mimic that for her. Her favorite toy is a little fuzzy duck that John named squeaky, but she also loves chasing the miniature tennis ball. Her other favorite past-time is untying my shoe laces as I stand at the sink. Thanks for all your house training effort. At this rate, we'll soon try getting her out of the gated kitchen to letting her run around the downstairs carpet under supervision. Hi Carol. I hope things are going well with the new litter of puppies. We were looking at them on your website the other day. They're all so adorable! I've attached a pdf copy of the receipt from our vet from Watson's surgery. Can you believe he's 6 months old already? He's doing great. He's almost 15 pounds now and his favorite place to be is curled up in someone's lap. House and crate training went fantastic with him, even with all the snow. Your suggestion to hang a bell by the door worked like a charm! Watson figured it out in only a couple of days. He's begun putting himself to bed at night in his crate when he's tired. Our vet always has something good to say about his coat or his friendly attitude. More than once she has remarked that we "got a good one." I've attached a couple pictures of him for you, too. 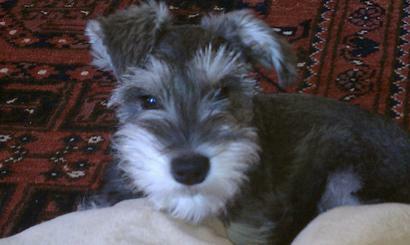 Milu is three months old now, and weights about 9 lbs. She is full of energy, and as smart as she could be. We are all having great fun learning about the world. We want to ask again when we should increase her food (we give her 1/4 cup three time a day), and when we should start feeding her only twice a day. We are giving her only the "Fish & Chips" and little pieces of carrot for an occasionally treat. We hope all is well with you and your puppies. I think Hailey is adjusting great. She went to the vet yesterday and everything checked out great. We have been taking lots of pictures. We haven't been crating her at night. She has been in bed with me and sleeping the WHOLE night. I thought she would be needing to go out at night, but that is not the case yet. I keep waking up to check on her throughout the night. I will send the new pictures this weekend. We had Abby to the vet this morning and she is in terrific health. She was very good and didn't seem at all frazzled about the vet's office. She ignored the Beagle and Schnauzer (he was a beauty, very silver looking) but when the Mastiff came in she went nuts barking. Ken was holding her and told her to shush, which she did, but continued with this very menacing deep growl. It was too funny. The mastiff backed away which had everyone in stitches. She weighs 5.5 pounds and today seems to have really settled in. She is just full of energy and loves to play. Ken and I have laughed more the last couple of days that we have in a long time. She woke up once last night, but went right back to sleep after I told her goodnight. I made her a little coat yesterday, which was good as it was very chilly to have her out. I downloaded the pattern from the Internet, but need to do another one, as it isn�t quite long enough down her back. 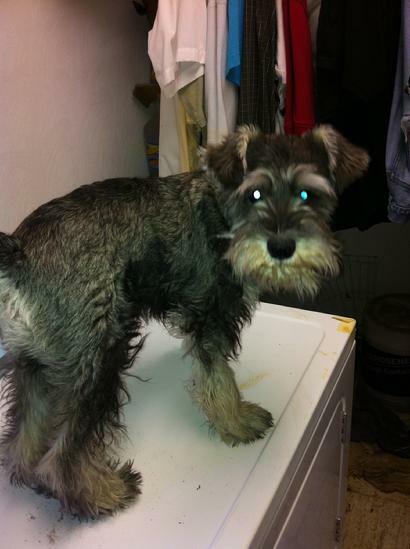 We leave Abby�s crate open and she comes and goes as she pleases. So far there have been no accidents in the crate. We keep her contained with the crate in the play yard. She is very curious about everything and tries to get in every tight spot she can find. We take her out when we are certain she has just finished going to the bathroom. She loves romping around the house and we play �come� with her. She runs to the person saying come and jumps high into our arms. We had a tough time this morning as she twirled around in her poop before I could grab her so I had to wash her up early this morning. We just barely made it out of the house in time to be on time for the vet. Ken and I just laughed at how it took two of us to get that done. You would think we never had any children before. Have a great Christmas and thanks so much for our little Abby. We already love her a lot. I just wanted to let you know Ruby is doing just fine. She is a ball of energy and is enjoying her new digs. She slept in a crate with Maggie. She cried for about 10 minutes, but eventually fell asleep. She has taken to one of the cat beds and this is where she keeps taking all her toys and does most of her playing. She easily found the water fountain and loves drinking out of it. She also enjoys stalking and chasing one of the cats. 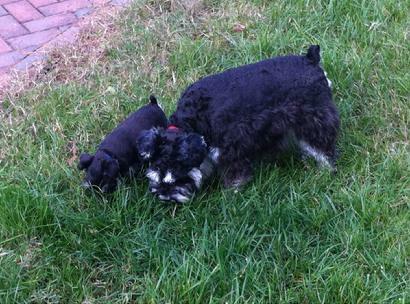 Maggie is cautiously getting to know her and feels a tad bit threatened by the new addition. I fed the both breakfast at the same time and did so right next to each other. To my surprise, Maggie behaved very well and they both enjoyed their meal. Hope all is well. Myron is doing really well! He already knows Sit, and can also do it by a hand command, he knows Leave It and Drop It as well. So we are pretty happy with his progress. He is definitely coming along really well with his potty training so that's great! All is well with Belle. She is such an adorable pup and has won everyone's heart. Well almost. Bitzi is warming up but still is a little unsure as to why this baby is running around her home. Belle wants Bitzi's attention but Bitzi isn't quite there yet. But the good thing is that Bitzi doesn't have a mean bone in her body so there hasn't been any confrontations at all. I noticed yesterday that Bitzi was taking more of an interest in Belle so I don't think it will be too much longer before we find them snuggled up together. Belle doesn't know what to think of my little granddaugther, Skye, but they are both very gentle with one another. Cute, they will be growing up together. Our visit to the vet was successful and there were so many oows and ahhhs. Belle checked out fine and we take her back in two weeks. Belle has had one accident in the house and that was one me so I can't complain. She lets me know when she needs to go out but crying and I can now tell by the cry that it is "I need to go out" cry. Thank you so much for such a sweet little girl. We all love her. Bosco did fantastic on his journey to his new home and slept through the night without even a wimper. He loves his crate and just goes in to take naps. He is getting a lot of attention and seems to be enjoying his new surroundings. I think the pink blanket really helped. Today we are taking him to our church. This is the feast day of St. Francis of Assisi who loved animals, so they do a blessing of the animals in a beautiful garden in back of the church. His first outing! Love the pics on the website. Take care. Wow, we got a lot of snow up here. Philadelphia has a total of 74 inches for the season! Enough! Hope all is well with you. How's Lola? P.S. Ray told me to tell you, he's home from work and Miss Bella is on his lap while he is reading the paper! I just saw that Lola had 7 puppies! Congratulations. 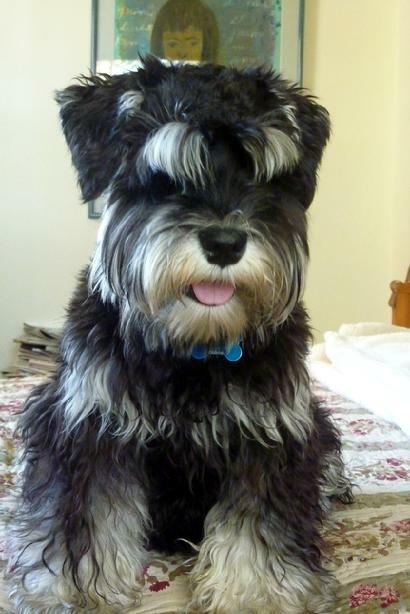 I need to send you the papers about Bosco;s neutering. Is my invoice OK. He also had a rare situation with his teeth. He had to have 12 baby teeth pulled. His adult teeth had come in alongside the baby teeth. The vet said he usually only sees this in very small breeds. Weird! He is doing great. He now weighs 18 lbs. and is in the mddle of beginner's obedience class. He is so adorable and loves to stay outside as long as he can. Enjoy the new additions. All is well here on the home front. Bella seems to have settled in nicely. 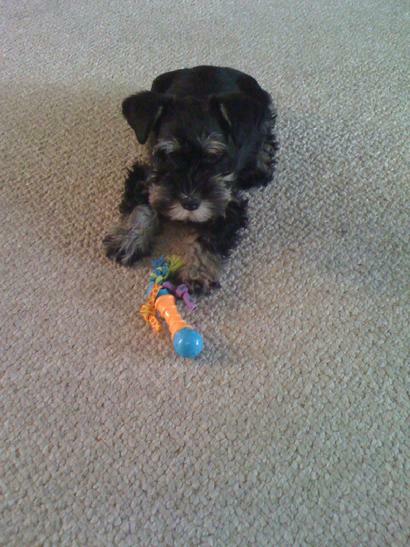 Her main adjustment has been Frodo my daughters schnauzer, it will take some time to learn to share all the toys and get use to each other. She slept in my bed last night and was just fine. She went for a couple of shorts walks today and tried to eat anything blowing her way. Bella is going to see the Dr. Rosenbluth tonight for her appointment; the staff is so excited about her coming. 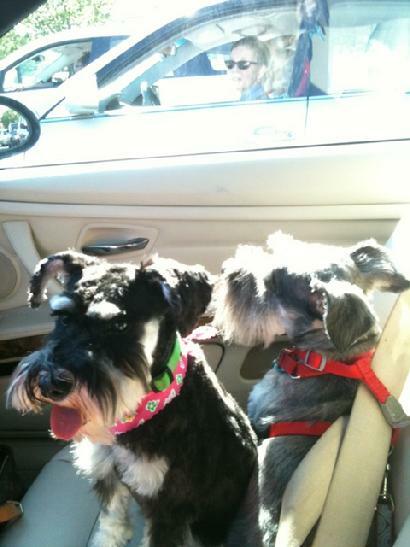 They have loved all of my schnauzers and am sure that Bella will be the bell of the ball (even if it is at the vets office). 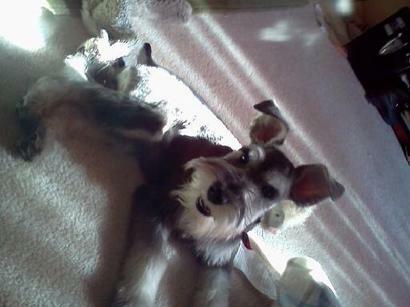 Attached are a couple of pictures of Bella. We thank you for such beautiful puppy and are truly grateful that you chose us.